Challah, the classic Shabbat and holiday bread, is made from a soft, often egg-enriched dough that can be shaped in many ways. A 3-strand braid is one of the simplest shapes to master. This method, illustrated in this step-by-step guide, begins at the top of the loaf. 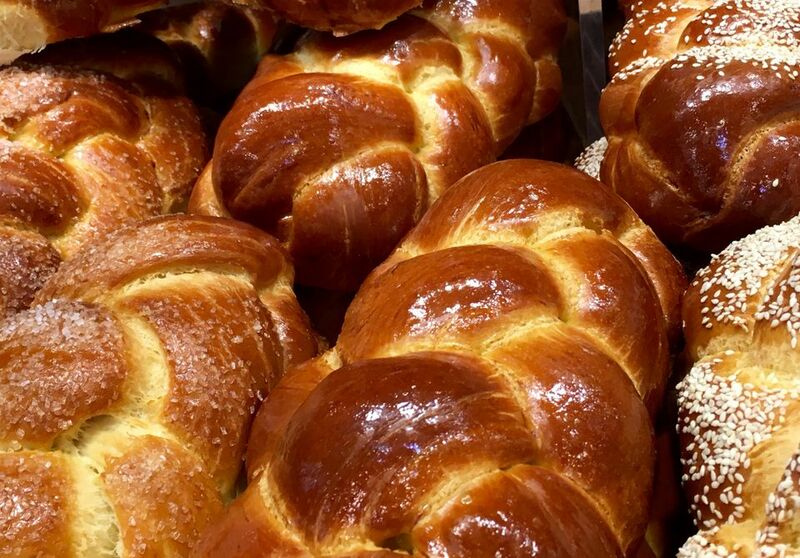 Prepare your favorite challah dough recipe. After the dough has risen, separate challah, if necessary. For each challah loaf, divide the dough into three equal portions. You can do this by sight and feel, or by using a kitchen scale to check that the lumps of dough are about the same weight. With clean, lightly floured hands, begin to shape and gently stretch the dough balls into log shapes. Place the dough logs on a very lightly floured work surface and use your hands to roll and pull them into long rope-like strands. Use even pressure as you roll the dough, in order to maintain an even thickness along the length of each rope. Place the challah dough ropes on a baking sheet that has been lightly greased or lined with parchment paper. The ropes should be lined up side by side, but not touching -- you'll want to leave at least an inch between each rope so that you have enough room to braid. Tip: If one of your dough ropes is bigger or smaller than the others, make that one the center strand. Firmly pinch the ends of the dough ropes together on one side. This will hold the top of the loaf together while you braid. Tuck the pinched ends under the loaf to help hold them together while you braid, and while the challah bakes. Begin to braid the challah by lifting the dough rope on the right and passing it over the center rope (the rope to the immediate left). Now, the rope that had been on the right becomes the center rope. The original center rope is now on the right. The rope on the left has not moved. Take the dough rope on the left and pass it over the center strand (the rope to the immediate right). The rope that had been on the left is now in the center. Continue braiding the challah by alternately placing the right rope over the center rope, then the left rope over the center rope. Try to keep the braid fairly tight as you work your way down the loaf. When you've braided all the way to the bottom of the loaf, pinch the ends of the dough ropes together, and tuck them under the loaf. This will give your challah an attractive, tapered shape, and help hold the braid together while the loaf rises and bakes. Cover the braided challah loaf with a clean tea towel, and allow it to rise until doubled in size. Brush the loaf with an egg wash and bake according to recipe directions.